The 10th edition of Advanced Engineering UK took place at the National Exhibition Centre in Birmingham from the 31st of October to the 1st of November. The event is the largest of its kind, covering many UK and Irish Industries in the areas of Aeronautics, Automotive, Composites and Advanced Materials, Connected Manufacturing and even Nuclear Engineering. In addition to the Trade Exhibition, Advanced Engineering hosts a number of talks from leading Industry and Academic professional. This year’s presentations covered a wide range of challenging areas affecting the Industry, such as digital and Industry 4.0 transformation, the emerging skills gap in the sector and future proofing supply chains (and yes Brexit was mentioned too). Among some of the leading companies presenting at Advance Engineering included Jaguar Land Rover, Siemens, Boeing, HP, Kawasaki, Nikon and Omron Electronics. 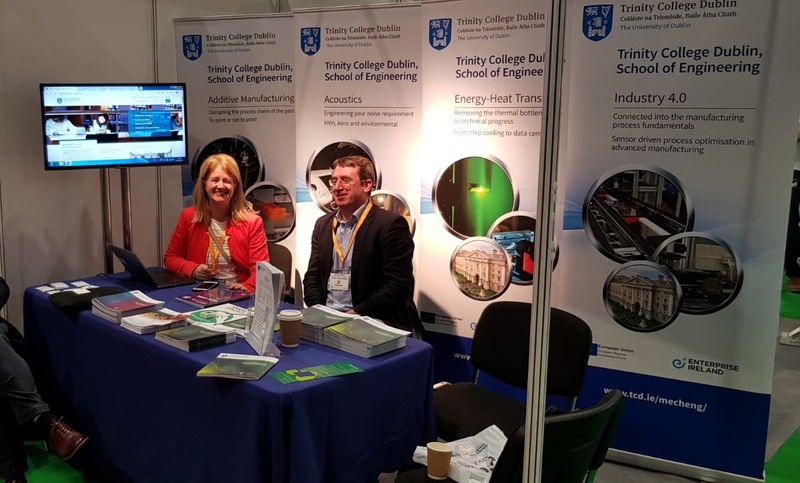 Trinity College Dublin had an outstanding presence at Advanced Engineering this year with 4 presentations in the areas of Aeroacoustics, Additive Manufacturing and Industry 4.0, Advanced Material processing, Heat Transfer & Fluid. Transforming Aeroacoustics and NVH using additive manufacturing – Prof. Henry Rice. Dr Chris Keely, Senior Business Development Manager, gave a talk on how Industries can engage with Trinity College Dublin to access research outputs, strategic technologies, world-class infrastructure and talent to drive their business forward. This was the second visit to Advanced Engineering by the Industry Engagement team led by Chris. “It’s a very busy couple of days at the show, not to mention the work before and after, but well worth the effort in terms of Industry leads for research, business intelligence and profile for Trinity”. CK. Trinity College’s E3 institute is an ambitious plan to bring together Engineering, Environment and Emerging technologies. E3 will equip the next generation graduates with the necessary interdisciplinary knowledge and skills to tackle today’s global societal challenges driven by changing demographics, climate change, urbanisation of global population and depletion of natural resources. E3 Institute initiative received this year the single largest philanthropic donation in the history of the state (€25m), to build its new Learning Foundry a 6,086 m2 facility based on the main Trinity campus that will host 1,800 new STEM students (50% increase). The Trinity’s School of Engineering is one of the oldest in Britain and Ireland, it was founded in 1841. It offers professional programmes in mechanical engineering, manufacturing biomechanical, electronic, civil environmental and computer engineering. The school supports approximately 100 PhD students and over 150 graduates from its Masters programmes. Trinity Research & Innovation helps Industries and Businesses every day through world class knowledge, expertise and infrastructure to meet their research and innovation challenges. TR&I also provides a point of connection to Trinity’s College ecosystem & network, access to intellectual property and support to leverage research funding (sharing costs & risks).